With ‘Resources’ you can upload useful documents to accompany your course. To see an interactive example of the different ways you can use Resources, please see here. Then choose from the two download options. 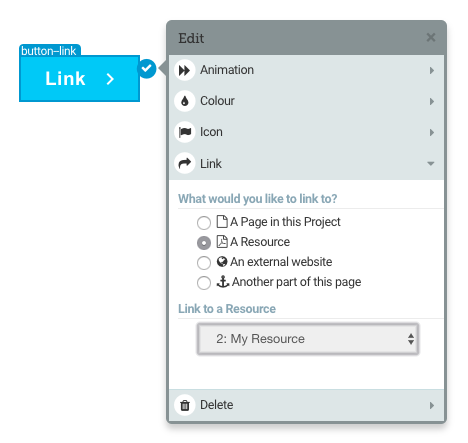 If you wish to link to your resource in the project text, choose ‘Use the browser’s default behaviour’. 💡 Pro Tip! Please note that the ‘Force this file to download onto the Learner’s computer’ setting’ cannot be used with the ‘Offline backup’ Release mode. When you are happy with your settings, hit the ‘Upload’ button. Resources can be PDF, Word, Powerpoint or Excel files, and can be up to 4MB. 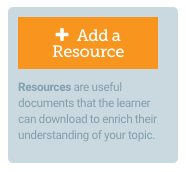 Once you have uploaded your resource, these will be listed in the Resources section or you will be able to select them from the 'Link' menu. If a Resource is added to a Master course, it will be visible in all Variations based off that Master course. If you wish to have different resources for each Variation, please upload these directly to the Variations.